This story is based on two articles that first appeared in the DX Times in March and April 1983. Broadcasting began in the Colony of Fiji in 1935, when Amalgamated Wireless (Australasia) Ltd opened station ZJV through its subsidiary Fiji Broadcasting Company. A studio and 500 watt transmitter was operated from a 2 room location in Suva. From this small beginning, the people of Fiji were gradually introduced to the marvel of “wireless’. World War II had immediate and long-term effects on the Fijian broadcasting scene. The need for ready communication of the war situation to the population led to the recruitment of Hindi and Fijian translators and announcers. When the war ended, the Fiji Broadcasting Company applied to the Colonial Government for funding assistance to extend its limited services. Two viewpoints developed out of this – one was that the national broadcasting service should be independent of government; the other was that broadcasting should be nationalised and run as a government department. Following the findings of a Review Committee in 1947, a proposal for a BBC-type statutory body was finally accepted, and a Bill to this effect was passed by the Fiji Legislative Council in 1952. The Fiji Broadcasting Commission assumed control of broadcasting on 1 July 1954. Headquarters of the FBC is Broadcasting House in Suva. The main transmitter site is at Naula, same 9 miles from Suva. This was once the location of FBC’s colony-wide Shortwave Service, but the use of shortwave was phased out in the early 1970’s following the inauguration of additional medium wave transmitters in Rakiraki, Sigatoka and Labasa, to complement the older Suva and Lautoka installations. Also gone are the VRH call-signs which graced the FBC QSL cards of that era. 20 years ago, the shortwave transmitter line-up was VRH4 4756kHz, VRH5 4705kHz, VRH8 3230kHz, VRH9 3284kHz (all with 10kw output), and VRH6 5955kHz and VRH7 6005kHz, with 350 watts. Since Its formation, the Commission has undergone many changes and expanded considerably. News-wise, BBCC, ABC and NZBC news relays were carried in the past, but today Radio Australia is the main source of overseas news. Now a 3 channel, 3 language service, the FBC maintains an 19 hour a day, 7 day a week service, with approximately 90 hours in English, 90 hours Hindustani and 70 hours of Fijian language programming each week. 7 other language groups are also catered for. Major technical improvements have been undertaken with the installation of new studio equipment and new fully solid-state transmitters. Most recently updated are the Sigatoka installations. A new programming venture is the advent of local and regional community broadcasts, with low power transmitters installed In Suva (1009kHz) and Lautoka (990kHz). Note that these two stations have used “1089” and “989” for identification purposes, but the Vomo Street Lautoka transmitter is definitely on 990kHz. Programme, and facilities are constantly under review to keep pace with changes in this multi-cultural Island nation. It is not an easy task when one considers the one hundred or so inhabited islands in the Fiji group, and the racial mix which makes up the population. 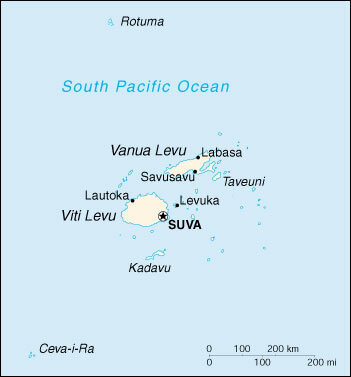 About half the population Is concentrated in the towns and cities, the largest being the capital Suva with 70,000 people. The other 50% of the Fiji Islanders are scattered in small and often quite isolated rural villages. Communication is difficult and Radio Fiji is the only medium which effectively reaches almost all the population. Programmes range from those suited to a sophisticated urban audience to those appropriate to subsistence rural dwellers. 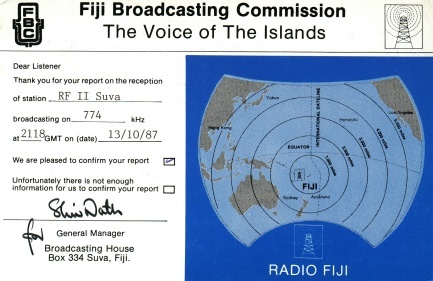 1995 saw the return of private enterprise to the Fijian broadcasting scene with FM96 providing alternative programming for Suva listeners, and direct competition for FBC’s own Radio Fiji III FM outlet. Looking to the future, Australia’s AUSSAT direct broadcast satellites can be expected to play a key role in the introduction of a fully fledged television advice for Fiji. Based on information provided by FBC. The essence of these remarks are to amplify those of Bryan Clarks and his station of the month Fiji Radio. First the corrections, I think that ZJV came on the air in 1933 or 34. As a very attractive teenager in April of 35 I pressed my nose against the front windows of ZJV in the Cable & Wireless building on Marine Parade in Suva. The AWA 500 watt transmitter stood across the front left corner of the room diagonally so that one as keen as I, could see the… err, guts. The transmitter stood on two feet high legs and was about three feet by five feet and contained a pair of STC tubes in the final in push-pull, grid modulated. The antenna was a centre-fed horizontal affair about l50ft long slung on very elegant wooden masts in the back. An open wire 300 ohm feeder ran under the balcony roof from the front of the a small control table in the front room with ONE turntable with an EMI or HMV pickup. On the far wall was their proudest possession, a Siemens Blattnerphone, a steel tape recorder with reels about three feet in diameter, the only one that I have ever heard of in the Pacific area at that time. The programming policy at that time was Fijian music which was not available on 78s (Isa Lei had not yet been written). The main studio had Marconi carbon microphones and don’t think that I would sell my grandmother for one of these today. French windows gave entrance to the studio from the verandah which was the waiting area for the performers who reclined on the floor. Later in WWII, I spent some time in Fiji with the RNZAF mainly at Suva Point where I installed a tower and some control panels and audio equipment with patch panels. One of the many RCA AR88 receivers in the racks was always tuned to ZJV and one of my very clear memories is the sound of ZJV playing ‘Rum and Coca-Cola’ with quality that resembled a five watt amplifier pushed to fifty watts. A year or so later I spent considerable time flying between Fiji, Tonga, Samoa and Rarotonga and on one memorable wet Saturday afternoon flew from Nausori to Tonga with absolute zero visibility, turbulence that would make a cat sick and the knowledge that the highest point in Tonga was 15ft above sea level. With a little more than half the distance travelled the navigator became extremely green about the gills and was in no condition to navigate to Tonga or Tuatapere for that matter. I set the compass receiver on 920kHz and also the Bendix ten tube communications receiver but no luck, that damned AWA crystal set connected to that Mickey Mouse antenna in Suva was strictly out to lunch. I have never forgiven them. Still later on around 1975, Fiji Radio had moved to their present hilltop site near the airport (now who in their right mind would plan such a combination, I do believe it was the same bunch from the NZBS who put 2AP on the top of a mountain in Apia on 1420kHz). Radio Fiji had a wonderful frequency around 590 but with their site they had to load a 150ft tower and on top of this , their transmitter was home built to a NZBS design with a linear stage in the final. The result was such heavy static interfering with listeners’ reception in Suva nine miles away, they could have switched everything of f and went to bed. I sold the Fiji Commission some modulation transformers, reactors and tubes to modify these hopeless cases to plate modulation. I revisited the site a year later and found that the 10kW had been turned down to 6kW with less than 75% peak modulation to “save the tubes”. God help us. Since this time the Commission have investigated the use of pulse modulation and now are starting on a new equipment program that will bring them into the 1980s. A footnote if I may, I visited the Suva studios about two years ago on a Sunday to enquire after old technical friends but, being Sunday, there was only a young Fijian trainee on duty who I talked with for some time. He was very enthusiastic and was prepared to sit three exams that year to obtain full technical status. I was very impressed with his attitude, so told him that if he kept me informed and that he passed all exams, I would arrange a surprise for him. Well, he mailed exam papers, and his very successful results, so he received a return airline ticket to Hawaii, where he became familiar with installations that may not hit Fiji for some years. I said that now he had worked with this new equipment on all Hawaiian Islands, he could pass a test that I would set and receive a diploma and another surprise. Pass this test he did with flying colours, so before he realised it, we were driving out from LAX to Disneyland and the Universal Studio Lot. He wore our Broadcast Services jacket and baseball hat the entire time and my fondest memory is sitting in the Sheraton Dining Room at the Universal Lot having dinner with the Maitre’d doing his damndest to get my guest to take that hat off without success. Good luck to Fiji Radio. I was very happy to read your account of radio communication and the initial starting of radio broadcasting in Fiji. The detailed history was a delight to read. I was born in Fiji on the island of Vanua Levu and lived in Fiji , Viti Levu and Vanua Levu until 2000. Currently I live in Sydney. My Former call-sign was 3D2RP currently I am VK2ISM.